Grandma Gildersleeve's Words Rise from Her Grave and Give the Lie to Ward Churchill and Russell Means! 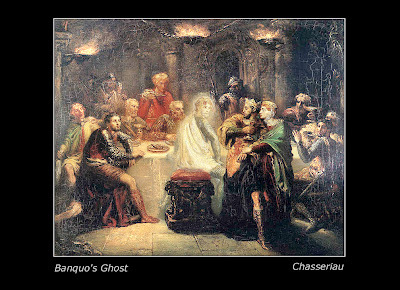 Banquo's Ghost Confronts MacBeth with his murders and usurpation of power. When the American Indian Movement (AIM) terrorists took over the Indian village of Wounded Knee in February 1973, they robbed Agnes and Clive Gildersleeve's Trading Post and held them hostage. Agnes was a 68-year-old Chippewa Indian; her husband was white. They had spent most of their lives in Wounded Knee. The Gildersleeve's store was looted by AIMsters and some villagers of about 150,000 dollars worth of merchandise, and the elderly couple were kidnapped by the terrorists and held hostage in the basement of a church. AIM's mouthpiece Ward Churchill is a discredited former professor and a white man who masquerades as an Indian. Ward Churchill claims in his bookAgents of Repression (1988 p. 143) that the Gildersleeves were white. Perhaps Ward Churchill thought that people would not listen to the eyewitness account of an elderly Indian grandmother if he claimed she was white. Read how Churchill describes the terrorist take-over of an American Indian town and then compare hiswhitewash with Mrs. Gildersleeve's eyewitness testimony of her ordeal at the hands of the AIMsters. "They [AIM] settled in for the night in a local church and the trading post of Clive and Agnes Gildersleeve (government chartered white traders who had long been accused of 'ripping off' reservation Oglalas)" (Joseph H. Trimbach. American Indian Mafia, p. 374.Citing Ward Churchill and Jim Vander Wall's 2002 edition of Agents of Repression, p. 143). The former Special Agent in Charge of the Minneapolis FBI, Joseph H. Trimbach, writes that although Ward Churchill claims that the Trading Post was "government chartered," the AIMsters who destroyed it justified their actions by claiming that the store operated without a government license (375). In my opinion, the AIMsters just wanted to steal, and since Judge Fred Nichol ruled in his court that most Indian property is nothing but junk of little monetary value, the AIMsters were free to steal from poor Indian people and go unpunished. According to the statement that Agnes Gildersleeve gave to the FBI on March 8, 1973, AIMsters knocked on their door late at night and said, "You are to consider yourself a political prisoner and hostage"(Trimbach p. 87). The terrorists put guards on her house and moved into her kitchen. On the third day, the Gildersleeves were taken from their house and held captive in the basement of the church. The day before they were moved to the church, an AIM woman came to the house and told Agnes' captors, "You have orders to shoot all hostages"(Trimbach p. 87). While Gildersleeves were held captive in the basement of the church, AIMsters searched their home looking for guns and stole their property. The so-called Indian activists even took Mrs. Gildersleeve's diamond wedding ring set and Indian jewelry (Trimbach p. 87). They rummaged through Wilber Reigert's documents and stole his Indian antiques. AIMsters stole or or vandalized the people's art and private property. Seehere and here. Agnes was told by one of her captors, "We want [Tribal Chairman] Dickie Wilson out and Russell Means in" (Trimbach p. 87). More about Russell Means here. When Gildersleeves were let out of the church, they were told they could leave town if they wanted to, although their car had been confiscated on the day that AIM arrived (Trimbach 88). Later the Gildersleeve's ruined car was recovered. It was filled with molotov cocktails (Trimbach 263).Judge Fred Nichol dismissed the charge of the theft of the Gildersleeve's car partly because the elderly Agnes Gildersleeve had not resisted armed terrorists when they demanded her car keys. Judge Fred Nichol also claimed that their three-year-old car was probably not worth much because cars on Indian reservations tend to be junkers; thus, their car would not be worth much since it was near worthless cars: "Anyone familiar with reservation conditions knows full well that a fairly new car , even if in running condition, might not be worth $100. The jury cannot be permitted to speculate as to an element of a criminal offense. The motion for judgement of aquittal as to Count VIII is granted"(Trimbach 263). Judge Fred Nichol basically ruled that even if Indians had something nice that it was worthless because it was near worthless property. This meant that criminals could steal or destroy Indian property and not be punished for a serious crime. I wonder if Judge Fred Nichol would rule like this if Ward Churchill's truck got ruined on an Indian reservation? Would his truck be valued at less than $100 because it was parked near Indian junkers? Or the corollary: If Ward Churchill drives a junker, I suppose it is deemed to be an expensive junker because he lives among wealthy people. The elderly Agnes Gildersleeve decided to stay in her home in order to protect her property and was guarded by AIMsters who subjected her to profanity. The terrorists took away the people's free speech and their ability to use the telephone to call the outside world for help or to tell their side of the story without coercion. Agnes was interviewed by the media while she was held under the control of her armed captors, so she had to say that she was fine. Recently Russell Means declared that he was starting a new country called the Republic of Lakota. I don't think people would like to be ruled by an unelected terrorist leader who once expelled a handicapped man from his trailer home, took hostages, didn't permit people use their phones, stole private property, and burned down the town. There are also reports of rapes and murders during AIM's reign of terror in Wounded Knee.